James McDermott: FUTURE WORM! - GLOOP all day GLOOP all night! All artwork and text is copyrighted by James McDermott, unless otherwise attributed to the respective copyright owner, it is illegal to publish or print any such artwork or text without written permission by the artist or copyright owners. 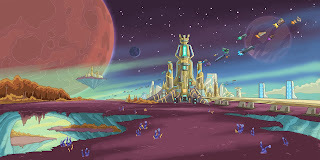 FUTURE WORM! - GLOOP all day GLOOP all night! Here it is! Disney XD's "FUTURE WORM! "...the next adventure in making a sci-fi show from scratch...oh season 1's. 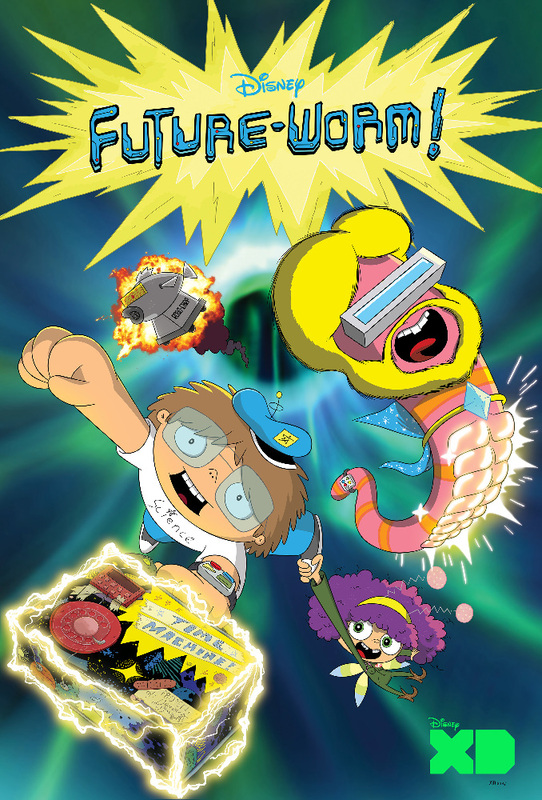 Let me tell you this boy loves science, "Future Worm" follows 10 year old Danny Douglas, (voiced by Andy Milonakis), whom befriends an ab-assaulting worm from the future, Future Worm, (voiced by James Adomian), skipping across the multiverse in a time travelling lunchbox. Ryan Quincy, (voice of Doug and Robo-Carp) , is our creator in chief, formerly from "South Park" as an animation director, and creator of the IFC series "Out There". 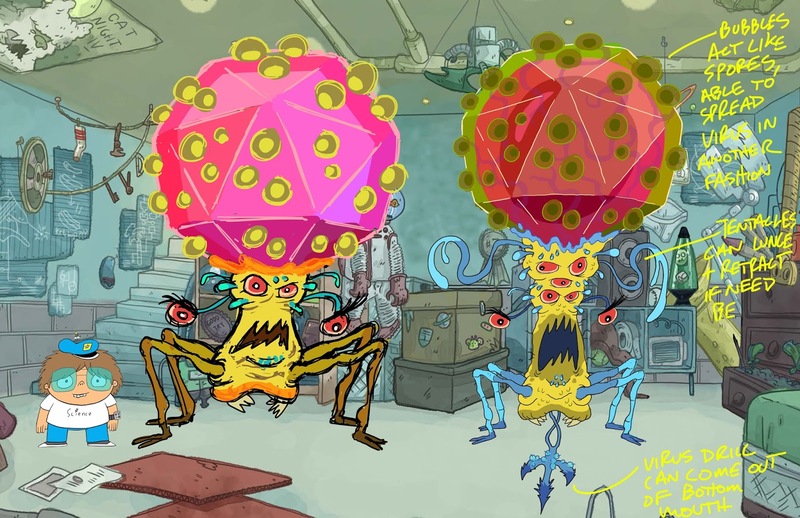 When Rick and Morty went on hiatus after season 2, we were informed of an extremely long break between seasons so everyone had to go and find work and thats when I met Ryan and joined the team at Disney. 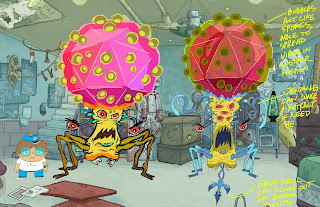 First design above is the Cold Monster virus character that wants to infect everything in its path, we changed the final color for the episode to feel more gross. Next one is the first rough I did for the show, a far out sci-fi cityscape for the Dr. D episode, our lead Bg designer Joey McCormick did the cleanup. GLOOOOOOOPIEEEESSSS! Are Invading and Glooping all over the world! We had to make an entire race of aliens and their worlds built out of spoiled milk. 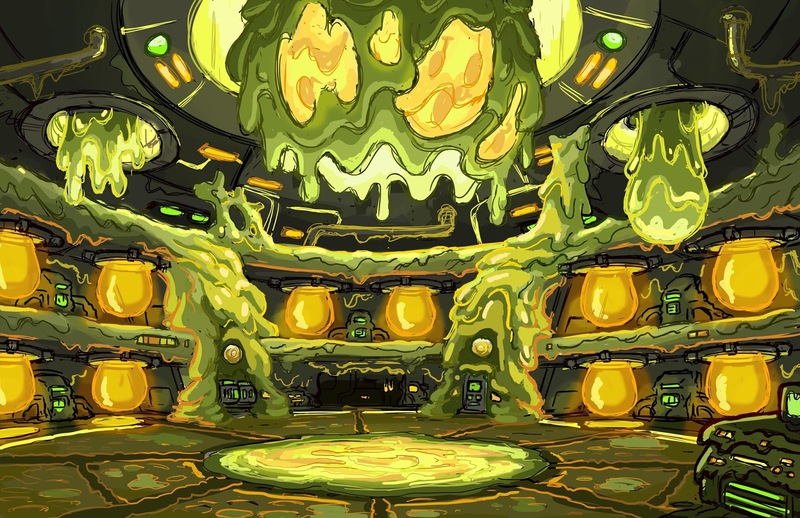 Above are some gloopy ship concepts, the idea was to interweave the tech plated metal ship underneath with globs of Gloop that have overtaken it. Last is the interior of the gloopy ship, in this sketch I thought it would be cool to show openings in the ceiling where gloopy character could pop through by the hundreds to surround Danny and Future Worm in a final stand for humanity. This episode, 'Captain Cakerz', features Neil deGrasse Tyson or as we like to call him NDT!, as an ongoing character throughout the series guiding Danny and Future Worm with his telekinetic powers and a little help from science. Excellent designs. I love how truly terrifying the cold monster is. James is currently a Sr. Concept Artist at a VR company called Squanchtendo. James most recently wrapped up Art Directing "Future Worm" for Disney XD, and most notably season 1 and 2 of "Rick and Morty" by creators Dan Harmon and Justin Roiland for Adult Swim.